NC Appellate Stats: How many dissenting opinions did the North Carolina Court of Appeals issue in 2016? How many dissenting opinions did the North Carolina Court of Appeals issue in 2016? As Matt Leerberg previously highlighted, it appears that judges on the North Carolina Court of Appeals are issuing more dissenting opinions. In 2015, 1.9% of opinions received a dissent while in 2016, 4.8% did. 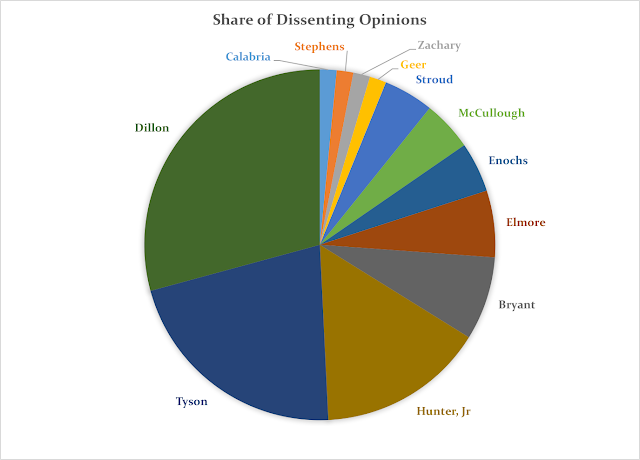 Here is a closer look at the dissenting opinions issued in 2016. In 2016, twelve different judges issued a total of 65 dissenting opinions, with three judges accounting for 66% of all dissents. 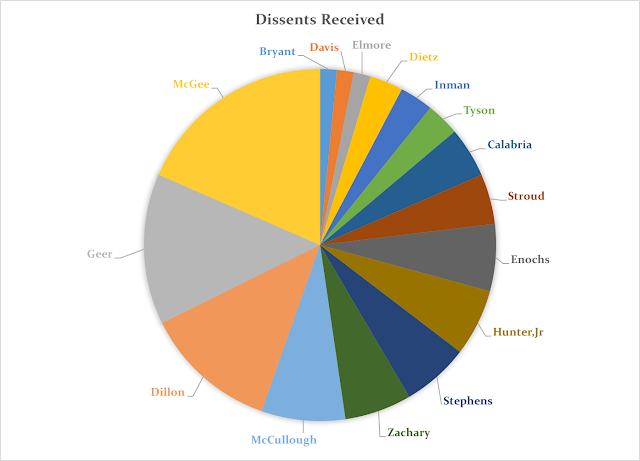 Sixteen different judges were dissented from, with Chief Judge McGee being dissented from most frequently. 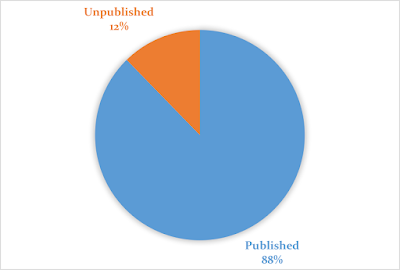 Finally, most of the dissents related to civil appeals, and only eight were unpublished. Here’s to hoping that the panel for your civil appeal includes McGee, Dillon, Tyson, or Hunter, Jr. I count dissenting opinions by COA number, so some of these dissents may be in related appeals that were not consolidated. This website is not endorsed by the North Carolina Administrative Office of the Courts or the North Carolina Judicial Branch. The information on this website is provided for educational purposes, and not for legal advice. 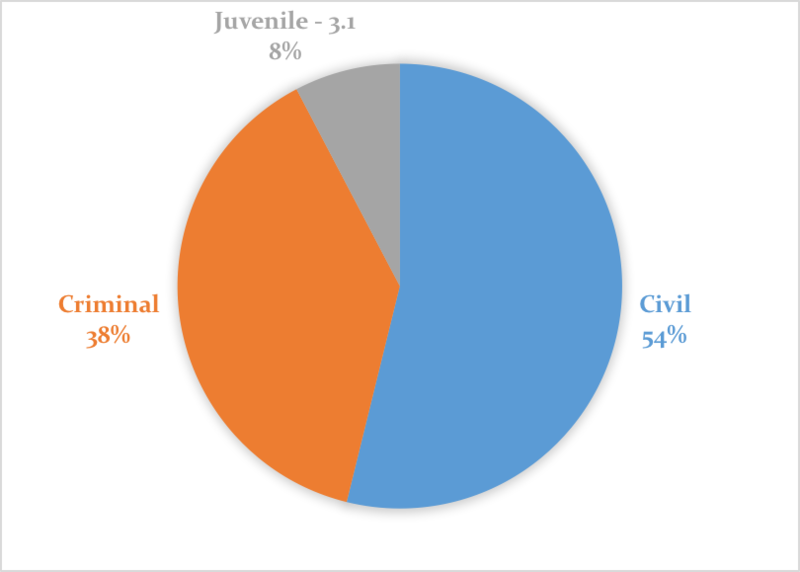 The information used to generate these posts is based upon objective, publicly-available data from prior cases and the facts or circumstances of future cases may not conform with historic trends. By using this website you acknowledge that you and the website contributors have no attorney-client relationship or express or implied contract. The information contained in this website should not be used as a substitute for legal advice from a licensed lawyer. The information contained on this website is not a substitute for legal research.